When I first started work at the Art, Design & Media library, I felt that we were under-utilizing the beautiful covers of the art & design books and journals in the library to market the items themselves. When users walk into the library, immediately to their right are 3 current periodical shelves containing major art and design publications. Most come with full color covers. However, all they get to see are 3 end panels with boring shelf guides bearing unfamiliar letters and numbers (Library of Congress Classification Numbers). The New Arrivals were displayed on a low bench and only a few were being displayed. Surely the library has more new books than that. With some planning and hard work, we are able to re-position the shelves so that the books and journals are facing the main entrance. Now, the covers can “sell” themselves. New arrival shelves were previously in 2 separate locations. A long low bench just after the library entrance and a 3-tier white metal shelf acting like a divider between 2 user areas. The plan was to move the white shelf to the entrance location and “retire” the low bench. Each shelf used to only display between 2 to 3 books. I thought this gives the impression that the library has few new arrivals, which isn’t true. We started to crowd the shelves and to use colourful bookmarks to denote the 6 specializations taught. 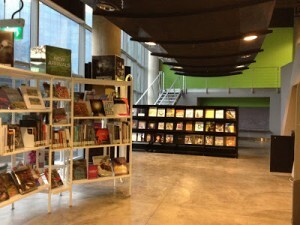 Prominent signs and a QR code leading users to the New Arrivals Category of the library blog were placed at the top of the shelves. After the change, we notice more people stopping at the New Arrivals checking out the books. We also noticed that they are lingering longer. There are 2 rows of current journal shelves positioned with the shelf ends facing the entrance. All visitors can see are 2 black end panels with shelf guides that have text too small to see from that distance. We decided to turn the shelves 90 degrees so that the longer side of the journal shelves become visible to visitors at the entrance. Colourful journal covers can now “promote” themselves. There is now more usable space too as we shifted the journal shelves closer to the glass windows. The next step is to experiment by placing an ottoman behind the journal shelves. We hope it encourages users to take time, sit down and flip some journals.